Kate Dagley, 46, and daughter Karen Jenkins, 27, were tricked into becoming full-time servants for a neighbour after they offered to help with chores. Wheelchair-bound Jean Kelly's family kept the pair in separate flats seven miles apart and forced them to clean for them, change baby's nappies and feed their dog. 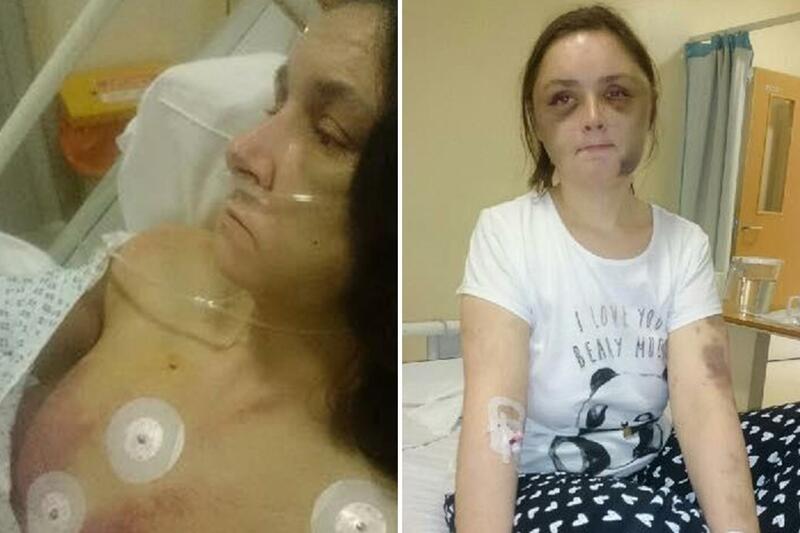 Miss Dagley sustained two fractures to her back, two broken ribs and bruises all over her face whilst her daughter suffered extensive facial injuries, a fractured breastbone and a broken finger. The mum and daughter were given one cigarette each a day as their ''wage". Cops eventually rescued the pair after another neighbour heard Miss Dagley's cries for help, and both were rushed to hospital with severe malnutrition. Today Miss Dagley, from Coventry, bravely told of her ordeal after Kelly and her family were jailed for a total of 46 years. She said: “The three weeks in which we were held separately were the worst of our lives and I truly believed I was going to die. I had no idea where Karen had gone but knew something terrible was happening to her too. ''During the time I was held prisoner, I was forced to clean for Jean and if she didn’t feel I had done a good enough job, I’d suffer the most horrific beating. "From sunrise to sunset I’d be forced to scrub her flat, prepare her food, wash her clothes and tidy up. It was torture. "When I was rescued I managed to ask where Karen was before I passed out. When I woke up I was in hospital, totally distraught as Karen’s mum, it’s my job to protect her and I felt I had let her down. I was devastated when I saw her tiny, bruised body." Initially both families were friends, after Kelly moved into their apartment block in Tile Hill, Coventry. But they fell out after the Kelly's falsely suspected the mother and daughter of stealing £50 from them. Miss Jenkins was then lured out of her mum's flat on the pretext of helping with childcare, only for her mother to be then be locked inside her own home with a key and the pair imprisoned separately. Miss Dagley said Kelly would call her into a bedroom where she wielded a wooden baseball bat she named "Bob" and was warned she would be '‘seeing a lot of him’'. Police discovered Miss Jenkins had been held prisoner in the flat of Kelly's daughter Anastasia Hitt, where she was ordered to sleep on the living room floor. In October last year Kelly, was jailed for 14 years after she was convicted of conspiracy to imprison the victims, inflicting grievous bodily harm with intent and forcing them to perform compulsory labour. Kelly's husband and Hitt's boyfriend Ian Healy, 29, admitted false imprisonment, and inflicting GBH with intent were also each locked up for 14 years. Hitt was jailed for four and a half years after she pleaded guilty to falsely imprisonment keeping Miss Jenkins in a state of forced labour. In statements read to Warwick Crown Court, Miss Dagley said she feared her eyesight “had been damaged long term” and suffers pain from damaged ligaments in her right shoulder when doing “simple tasks such as getting dressed”.